This doesn't happen very often, but I really like this card! (I usually don't get too excited about my own work ... I think they call that lack of self confidence? LOL!) I showed it to DH this morning, and he crunched up his nose and said, "is the star supposed to be obscure like that?". He didn't like it! That's unusual too ... he usually likes my cards, although sometimes I think he says he does just to humor me! Leave me a comment and let me know what you think of it! I used this week's SCS Color Challenge (CC169) of Real Red, Soft Sky and Blue Bayou ... perfect combo for 4th of July! My card was completely inspired by THIS CARD by elizard on SCS. The layout of elizard's card really caught my eye! The large star is a chipboard piece from On Board Accents, covered in Real Red Prints DP. Edited to Add: Marta asked where she can get the awesome star brads on this card .... they are from the Stampin' Up! Styled Silver Hodgepodge Hardware in the Occasions Mini Collection 2008 (pg. 7). Click HERE to view. I think it is awesome!! I love the big star!! That sounds like a man! The star is great and I love your mix of patterns, too! I love the star just like it is!! You can pat your self on the back...you did a "star" job. What do men know---their taste is all in their mouth hehehee. This is a GREAT card. Perhaps your DH prefers symmetrical shapes...I used to be that way, anyway. This card IS wonderful. Thank you for the inspiration. Love it Nancy! The star is perfect. My dh would say the same thing LOL! They just don't get art! I love it, especially the hph! This card is AWESOME!!! I LOVE it tooooo!!!!! Gorgeous card, Nancy. I love all the layers. WOW!! Great color combo! Love those DSP together! 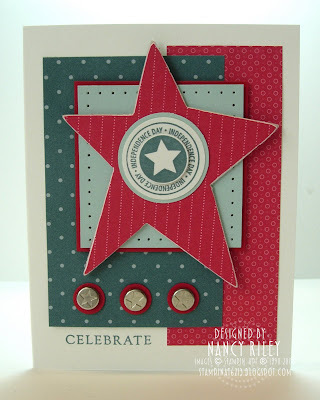 Nancy - your card is fantastic - love how you've used the CC. Perfect July 4th card!!! OOoh, I think it's super! A perfect mix! MAybe he doesn't like that funky, wonky star, but I like funky and wonky! I absolutely love this card! I just cased it on my site (http://www.polymerific.com/blog/). Hi, Nancy!! My hubby and I think we fixed our computer!! Woohoo...I've been having Nancy Riley withdrawals (wink)!!! This card is fantastic...love the colors and the large star!